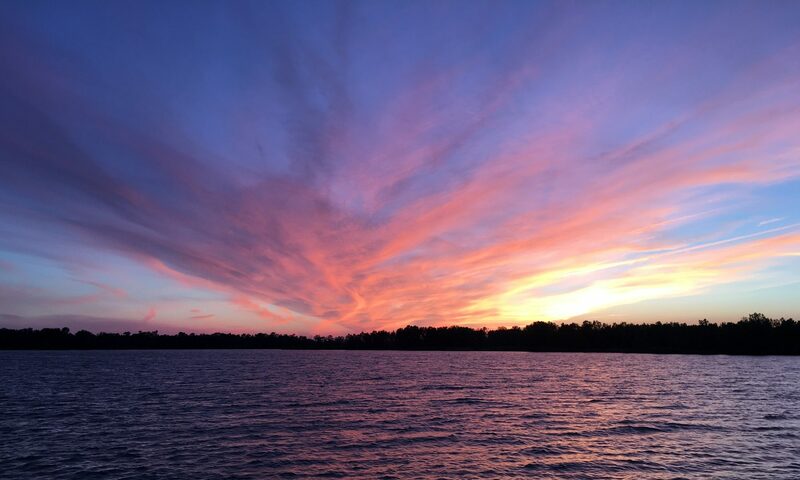 Our friends in and out of the sailing community are often surprised to find that we typically don’t stay in one place more than one night. “Why the rush? !” they ask. It’s a question we debate regularly, and I’ll admit our fast pace can make the cruising life a bit stressful at times. I’m sure this fast pace leads our European neighbors to box us right into the American stereotype of working one’s self to the bone., but there is so much to see. They don’t call the Great Lakes “great” for no reason. And the Mediterranean, well, let’s just say that it’s a massive body of water, steeped in history that puts our American history timeline to shame. Our original plan was to cruise the Med for two seasons – the first would be in the western portion, and the second in the eastern. With half of our first summer already in the bag, there was plenty more to see before we checked the box in the West. But whoa … hold on American cowboy! Are we done with the island adventures of Sardinia and Corsica? Not yet! It was time for a second helping of island exploring. With clean laundry, full water and diesel tanks, and a fresh wash-down of the deck, we were squeaky clean and channeling our new European slower pace as we approached Cala Dei Gabbiani. It was perfect timing, with the late afternoon light throwing the cliff walls towering above our heads with changing colors, as the fleet of small rental boats marched their retreat back to Gnone. We soon found ourselves all alone in a little nook in the shoreline, complete with our own private beach, behind which was a small cave for exploring. While there are sandy beaches in this area, more common are a water’s edge full of shiny little white and tan round stones. As the wavelets land on the beach, these stones tumble over each other, causing a peaceful rustling noise, not unlike the sound of downed leaves rustling along on a New England fall breeze. We stared out into the sea of fading light, with our boat rocking ever so subtly on her moorings, red, yellow and orange colors embedded deep into the vertical cliffs on both sides of us, and the rhythmic melody of waves sliding up the pebble-filled beach front, lulling us into submission. Could there be a closer place to heaven? I’m sure we had a good reason the next morning to raise anchor at 8am, but in retrospect it seemed hasty still. It’s hard to completely shed the go-fast American culture, but we were certainly trying. In a barely traceable breeze, we kicked the motor over and headed away from this magical place, laying a bubbly wake line so straight we were mimicking the jet trails drawn on the blue sky above, as we settled into a watch schedule of two hours on, two off. In the afternoon, the wind responded and gave us something to work with, and we raised sails with the wind at our back and the peace that comes with shutting the engine down. It’s a sound that settles in with you, and not until it goes away are you reminded of the true sounds and smells of sailing. At Capo Coda Cavallo, we passed our original destination, and carried on joyously in the following winds. Our course took us out to sea of the table-topped, box-shaped Isola Tavolara that we had passed a week prior with Matt and Michelle. On this route, we passed close ashore of Cala del Faro, on the eastern extremity of the island. The lighthouse is unremarkable, but it would be hard for any manmade feature on this island to stand out, soaring as it does to 1854 feet above sea level and labelled with the geological term ‘massif’. That is, unless NATO came along and subsumed the eastern half of the island to install long range antennas soaring another 400 feet into the sky. Now, you have a sight that starts to stir questions. Built in 1962, these ultra tall masts hold up wires strung between three points above the cove. If you are captain of a nuclear submarine, you’d be pretty happy this installation exists, as coded radio messages are emitted from their antennas. If you are an owner of a sailboat, you might be less thrilled. Our instrument that measures wind strength and direction went haywire when we were in the vicinity. At one point, it reported winds of over 100 knots. Simply amazing, as Sea Rose sailed through the storm like a champ! While the wind was actually something much less than 100 knots, it was building into a stiff breeze, likely due to the twists and turns the wind took as it crossed over the steeps of Isola Tavolara. 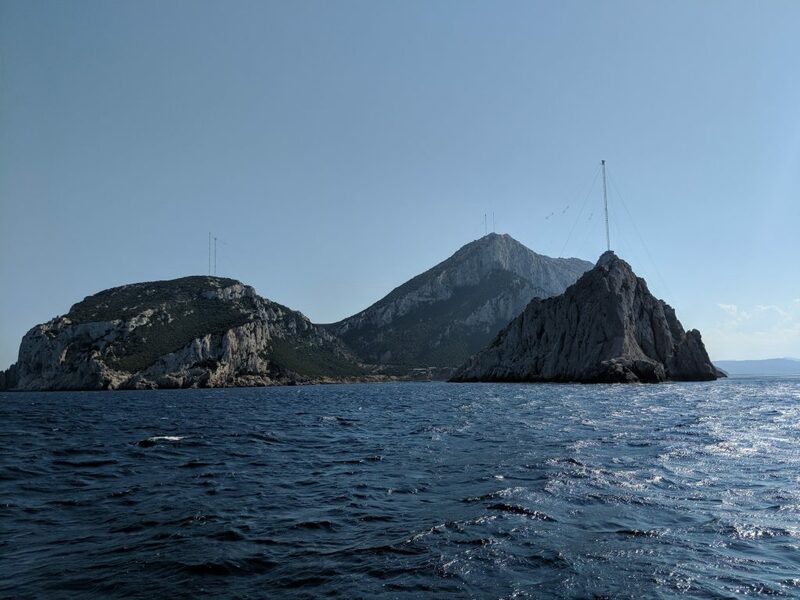 We tightened in on the sails as we came up to a close-hauled tack across the expansive Golfo di Olbia, leading to the busy ferry, cruise ship and super yacht harbor of Olbia. At one point, I counted three large passenger and cargo ferries in our vicinity, many of which are doing the milk run between Sardinia and the mainland of Italy. We were told that Olbia is a fine place to pick up or drop off crew, but since we were guest-less for the next two weeks, we pushed on. On the northern part of the bay, we squeezed into a little cove named Cala Moresca, nicely protected from the breeze by Isola Figarolo, sized just right to block the cove. The rest of our cruising kin choose to anchor on the windward side of Isola Figarolo, and downwind from a large fish farm, the logic at play here being questionable. It left us with our own private cove, with an occasional inflatable looping through to check out the scene. Timed correctly, you could get a quick dip in the water au-natural, with a little privacy. But timing your exit of the water appropriately is critical or you’ll be caught by a passing boat full of tourists, which happened to me! Rowing ashore the next morning, I was pleased to find a wide, level, dirt path that carried on into the town of Golfo Aranci, perfect for a restorative morning run. In a prior life, I was a regular long distance runner, but the sailing life, despite the perception of copious amounts of free time, is not conducive to running, so you take any opportunity to run when it comes. As I panted my way into the town, I was shocked by the number of cars passing me on the road, a road like most other island roads here with a nonexistent shoulder for pedestrians. Looking out to the harbor, I understood the reason – a large car ferry was disgorging its contents. It is enough to keep track of these behemoths on the water, now I had to dodge their minions ashore. Alas, the run felt splendid. Karen and I had the anchor up and pointed Sea Rose’s bow north on our last day in Sardinian waters. Initial headwinds gradually shifted to westerlies, and we were able to raise sail, once again heading offshore of the islands, giving us a fresher breeze and easier navigation. We gazed admiringly at the many coves in the La Maddalena island group and recalled the sweet memories of our time with Matt and Michelle. Leaving the island group to our stern, we got a further lift crossing the Bonifacio Straits and were rocketing across the water broad reaching in a healthy 20-25 knot blow. These are the Bonifacio Straits we had read about – gusty, choppy, hair-in-your-face winds. The La Maddalena islands mark the last outpost of Sardinia. As we crossed the straits, we landed back in Corsica and found their southern island group named Les Bouches de Bonifacio. Within this group, close to the main island of Corsica is the jigsaw shaped Ile Cavallo. We were looking for a harbor deep enough to anchor yet protected from the strong westerlies, which were forecasted to carry on through the night. We weren’t the only ones with this grand idea. 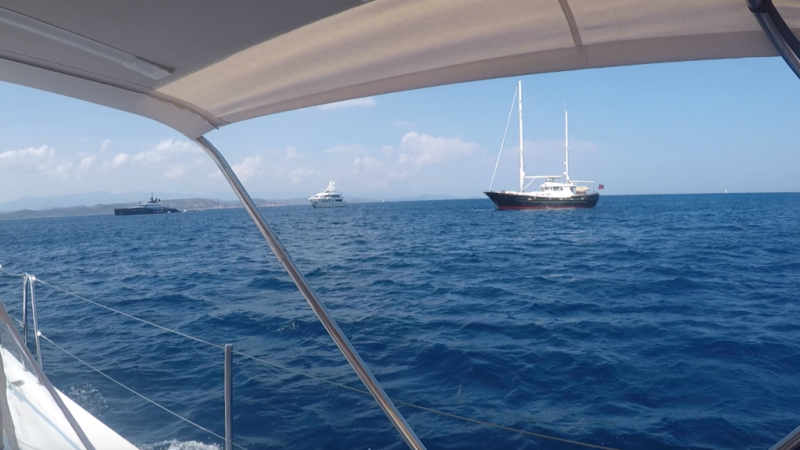 As we approached the little eastern cove, Cala di Zeri, what had seemed like small boats from a distance became bigger boats, and bigger boats became luxurious super yachts. Would there be room for our little 44 feet of Sea Rose? We continued on into the protection of the cove with all the confidence of a new IT consultant on his first assignment. Luck was on our side as we found room, aided by the shallow water that allowed us to put out less scope than normal. Resting easily on our anchor, with a strong breeze to keep us cool, we gazed in admiration. The water was a sparkling teal green and the few houses ashore were low-profile, single-storied residences with yards flowing into the sea, oozing subtle wealth. This was confirmed moments later as the thawk-thawk-thawk of a private helicopter grazed the sky above and landed in the distance. Shove aside, big boys, it’s time for Sea Rose to enter! A swim was in order after our salty crossing of the Bonifacio Straits. Teal colored water typically indicates a sandy bottom, and sand doesn’t usually hold much sea life, but in the shallows closer to shore we found rocky hideaways with interesting creatures using the grassy sea floor for protection. Although we had swam over our anchor to confirm it was set correctly, we kept a close eye on Sea Rose since she was on a short leash, swinging in a strong breeze. It was a good moment to look up. Promptly, another sailboat approached rapidly and dropped their anchor directly upwind of us. If they dropped back on even a limited 3:1 scope, they would be on top of us. What actually transpired, when they anchored with even less scope, was no better, as they dragged downwind, narrowly missing us, all the while giving us a stare that seemed to say ‘Hey Guys, can you move? You are in the way of me anchoring!” We watched in painful amusement as they dragged down on to the boat below us, with crews from both boats trying to shove many tons of weight with puny arms and legs. They pulled anchor and motored back upwind, once again anchoring right above us, and the scene played out again. These were second helpings I had no interest in receiving. The third time is the charm as they say, and these harbor entertainers finally chose a spot far downwind from all of us, and after dragging even further, appeared to settle into a momentary repose. So it was with trepidation that we watched a catamaran with a family in tow drop their anchor right next to us. Did we unknowingly possess some kind of celebrity status? My fears quickly subsided as the catamaran’s svelte young captain stripped down to his euro-style swim suit and dove overboard to check his anchor. I thought we were the only ones that took that precaution. If he’s this safe, we have nothing to worry about. The only concern remaining was how to pull Karen out of her trance. As she stared over at young-fit-man-on-neighboring-boat, it reminded me of Hermione’s love-struck stare into the eyes of Ron Weasley. If only I knew how to counteract the spell! What had seemed like a calm anchorage in the evening, turned into a rock and roll affair late at night as a new swell pattern found its way into the cove. It’s the cruising life – one night you sleep like a baby, the next you toss and turn until morning. We were up and away by 8:30am with the only blessing that the winds were still strong out of the west. Our course took us north along the eastern shore of Corsica, purported to be the less interesting side of the island. There was no doubt, based on our experience with Emmy, that the west coast was out-of-this-world beautiful. So if the east coast was just ‘normal’, that would be fine by me. Due likely to the height of the mountains running north-south across the interior of Corsica, our strong westerlies faded as the morning progressed, and finally died out completely. As it happens in the Med, moments later the wind switched 180 degrees and we had steady headwinds coming out of the north. What gives? 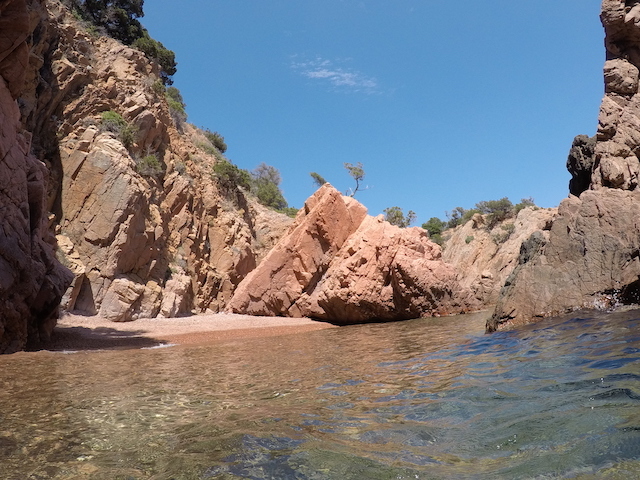 We tried tacking for a while, but we wanted time at our destination to explore before night fall, so we resigned to motor the rest of the way into the Golfe de Pinarellu. On the southern point of the golf, a narrow band of water, shallow enough to wade through, leads to the appropriately named little offshore islet Ile Pinarellu, prominent by its large square tower, unlike the previous round Genoese towers we saw elsewhere throughout Corsica. We nuzzled in close to shore to find depths suitable for anchoring, and jumped overboard, first to check the anchor, and then to snorkel around the island. I will say that our initial intention was to just snorkel to the shore and back, but the waters were unusually clear for this part of Corsica, the fish curious, and the sights around each corner more interesting than the last. We were dodging small inflatable boats early on, but as the water depths dropped quickly off the shore, there were fewer visitors. To our surprise, we discovered a grotto on the north side that opened up into more mini grottos as we snorkeled closer in. 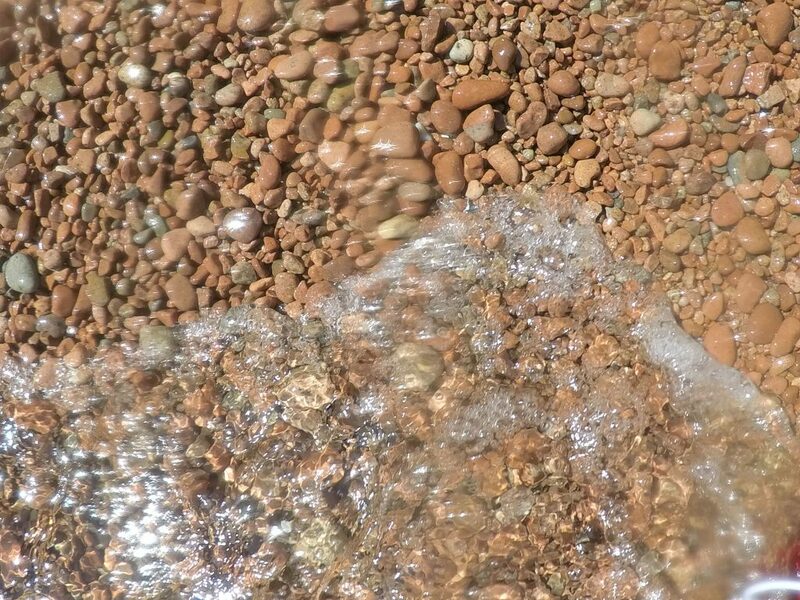 Landing at the beach to take a breather, I was once again charmed by small round pebbles, being cleansed by little wavelets, making sounds to sooth the soul. This time they were light tan and deep salmon colors, the makings I thought for a perfect screensaver background. Exhausted after our super-sized snorkeling adventure, we spent time reading and napping back onboard Sea Rose, rising in time to make our go-to Mediterranean dinner comprised of sliced tomatoes, fresh buffalo milk mozzarella, olives, and a few slices of ham. I suppose we could have eaten just as well out on the patio back home, but we’d miss the wavelets lapping against the hull and the mast swinging gently across a star-studded sky. Take me now, God, if you must. We were up before sunrise the next morning for our 75 nm trip across to Elba Island. Our second helping of Corsica was brief but no less memorable. 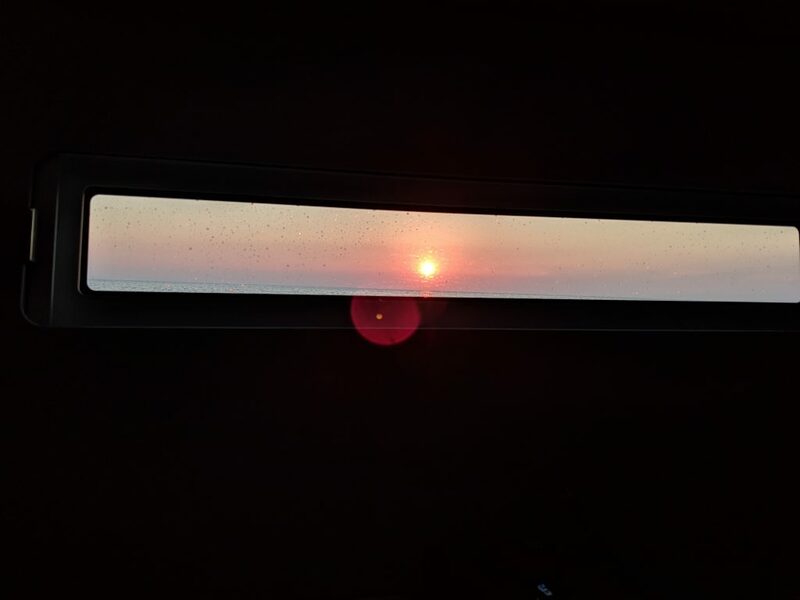 It is not often that you get the pleasure of watching a sun rise up from the horizon. If we are watching, it’s usually to bid adieu to the sun as it leaves us. I took the first watch on this day, taking with me indelible images of burnt red and orange colors cast against a long cloud front just above the horizon. It was attention grabbing equally for its beauty and for the threat of rain and wind. Fortunately we had none of the later. As the steeps of Corsica faded behind us, we crossed through a flotilla of five sailboats going exactly the opposite direction. I figured they must have left Elba in the middle of the night, possibly destined for the snorkeling pleasures of Pinarellu. The wind never really behaved itself, at times strong enough for us to reef, then dying out enough for us to shake the reefs out, and finally heading us. The seas were confused too, with at least two different swell directions, making the motion of the boat uncomfortable enough to deter any interest in eating or going down below. 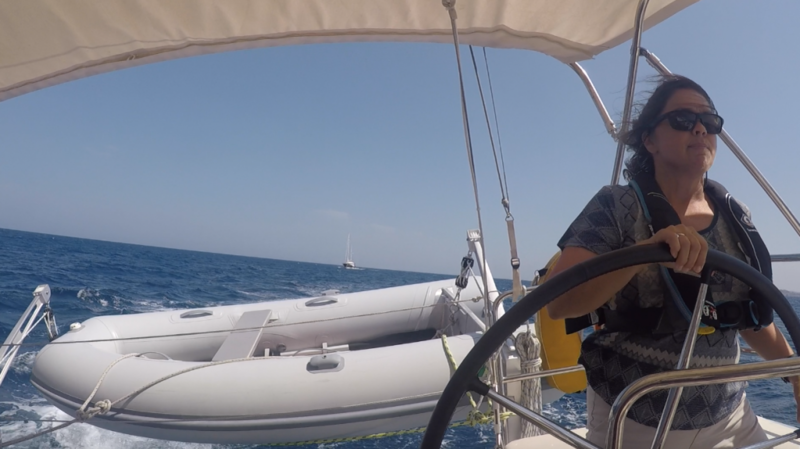 On my last off-watch, I was tired enough to nap in our berth, waking up in time to find Karen racing along at 7.5 knots on a flat sea as we approached Marina di Campo. Why does she get to have all the fun?! Be sure to also check out our YouTube video of this week’s Sardinia and Corsica adventure, and subscribe to our YouTube channel to get notified of future videos. Thanks for showing an interest in our adventure. 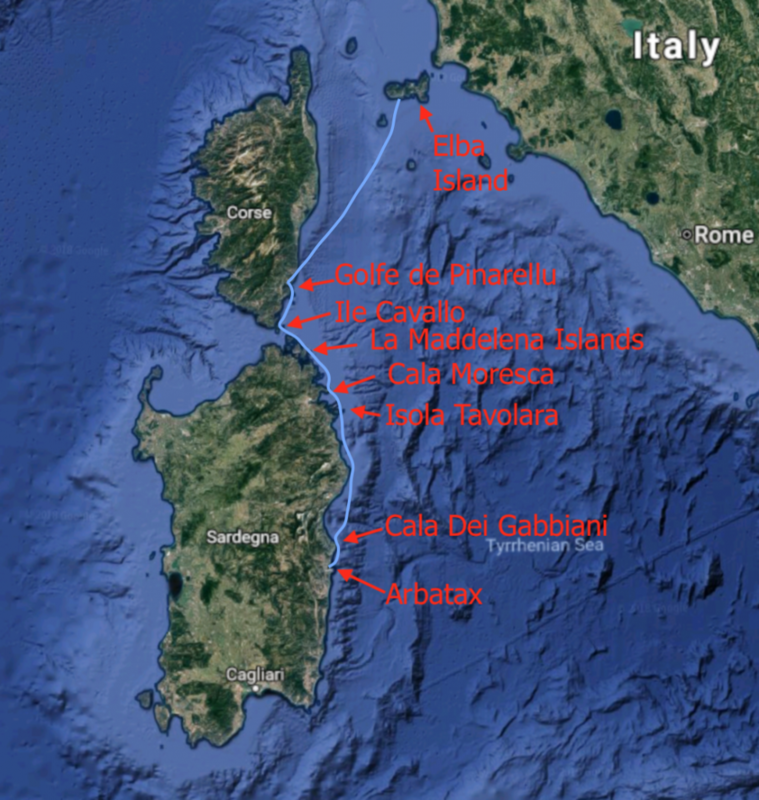 We will pick it up again next time with our experience at Elba and the other Tuscan islands off Italy. And, as always, we look forward to your comments and feedback! Enjoyed reading your account of Sardinia. My sister Wendy and her husband had a summer house in Sardinia, but switched to Puerto Adia in Menorca after a kidnapping for ransom happened to friends of theirs also summering in Sardinia. Yikes Martin, that’s scary! Glad you enjoyed the blog post nonetheless. Previous PostPrevious Sardinia – It Only Gets Better After Finding the Dead Man! Next PostNext Check out our YouTube channel for the latest Sea Rose videos!